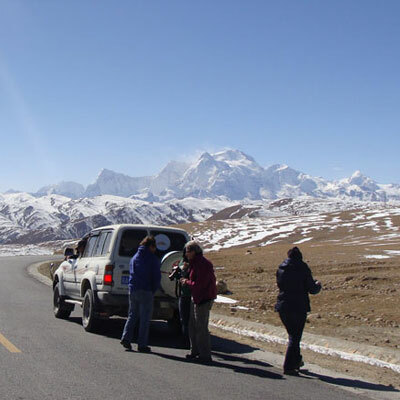 Beijing Lhasa EBC Tour is an exciting journey that created to explore and enjoy a magic blend of Tibetan beauty including its ancient cities, unique culture, nomadic people and its lofty mountains. This tour begins in the vibrant capital city of Beijing and boards on a world famous train journey to Tibet Lhasa on the train of the world's highest railway, the Qinghai Tibet railway. 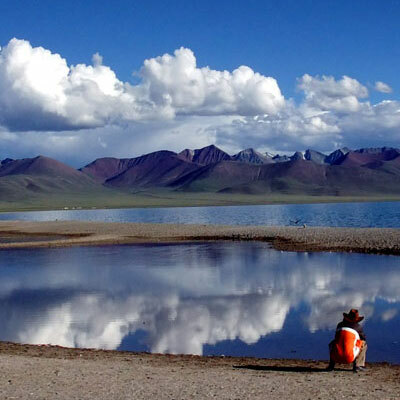 The exciting yet long and incredible journey forwards along the arid and high Tibetan plains and picturesque scenes of Tibetan landscape whiz by. The fascinating journey in the Tibet's high altitude, the train is well equipped with sufficient Oxygen – supplying equipments. Oxygen masks are available for those who are needy onto high altitude sickness. Upon arrival at the train station in Lhasa, guide provides warm reception and transfer to hotel. Beijing Lhasa EBC tour is a fully guided tour. Exploration of the ancient cities, historic palaces, monasteries and temples, a ride on the world's highest railway, hike to the world's highest Everest base camp, this tour provides an unforgettable memory for a lifetime. 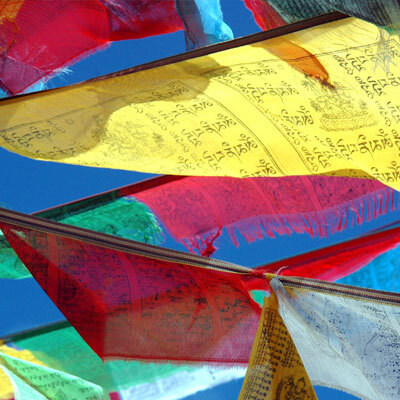 Beijing Lhasa EBC tour leads you on a whirlwind tour to three vibrant cities: Beijing, Lhasa and Kathmandu. Exploration of these three medieval cities provides you an insight into three ancient cultures, Chinese, Tibetan and Nepalese. The major attractions of Beijing Lhasa Everest base camp tour are the journey aboard the Qinghai-Tibet railway, exploration of the ancient Lhasa with Potala palace and hike to Everest base camp for a stunning view of the world's highest peak, Mt. Everest that will be an unforgettable trip! Furthermore, cultural exploration of the important Tibetan cites such as Shigatse, Gyantse, Shegar and Tingri are included in this wonderful journey. When you reach Everest base camp, we enjoy the view of the world's highest peak, Mt. Everest 8848m. Group size: 2 minimum to 14 max. Day 01: Arrive at the train station, transfer to hotel. Day 02: Guided tour of Lhasa city. Day 03: Guided tour of Lhasa city. Day 04: Drive from Lhasa to Shigatse via Gyantse, 350km, 7hrs. Day 05: Drive from Shigatse to Shegar, 265km, 4 hrs. Day 06: Drive from Shegar to Rongbuk base camp, 190km, 4 hrs. Day 07: Visit Everest base camp, drive back to Shigatse, 455km, 8 hrs. Day 08: Drive from Shigatse to Lhasa via northern road. 350km, 6 hrs. As an option, on the day 07 you can drive from Rongbuk to Nyalam instated of Shigatse and next day to Kathmandu. If you wish to drive down to Kathmandu then the tour duration will be 8 days only. Let us know if you want to end your trip in Kathmandu. Day 01: Arrive at Lhasa train station. After enjoying an incredible train journey, you will arrive at Lhasa around 18:30; our Tibetan guide meets you at the train station and transfer to hotel. Rest of the time will be rest and enjoy the dinner. Overnight at hotel. Day 02: Lhasa city sightseeing, visit Patala palace and Jokhang temple. Breakfast will be served at hotel, today is your first day on the high plateau so we leisurely start today’s guided tour and visit only two places; Potala palace and Jokhang temple. Jokhang temple is the holiest shrine in Tibet and was built in seventh century and located at the heart of Lhasa city, the circuit around it called Barkhor Street, is the best place to buy the souvenirs for your beloved ones. Potala palace is the popularly known as cardinal landmark of Tibet. The massive structure itself contains a small world within it. Mostly it is popular as residence of the Dalai Lama. The stunning view of Lhasa city can be seen from top of the palace. Jokhang and Potala both are the focal points of pilgrims from entire Tibetan world, multitudinous pilgrims are circumambulating and prostrating in their strong faith. Overnight at hotel in Lhasa. Day 03: Lhasa city sightseeing, visit Sera, Drepung monasteries and Norbulingkha palace. After breakfast, you will be taken to visit Sera, Drepung monasteries and Norbulingkha – summer palace of Dalai Lama. 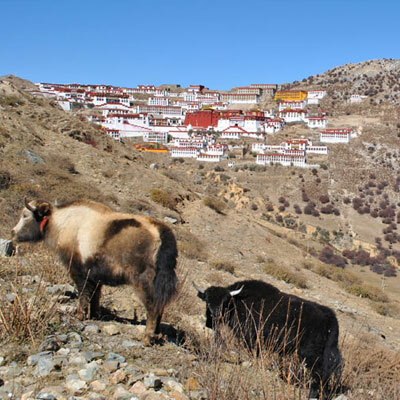 Both Sera and Drepung monasteries are Gelugpa (Yellow Hat) sect monastic colleges. Sera monastery is renowned for its Buddhism philosophical debate practice, the clapping sound and aggressive expression of the monks are well worth to observe. Drepung monastery was the seat of the government prior to Potala, it was once the world largest monastery in the history with more than ten thousand monks hailed from different monasteries from entire Tibet. Norbulingkha is the summer palace of Dalai Lama; we can visit the residences of different lineages of the Dalai Lama here. The palace has a beautiful park which remains crowded most of the time by picnickers and traditional activities during the Yogurt festival in August. Overnight hotel in Lhasa. Day 04: Drive from Lhasa to Shigantse via Yamdrok Lake and Gyantse. After early breakfast, we leave Lhasa on a private jeep or Van to Shigatse. While driving we cross Kampala Pass from where we can have a glimpse of Yamdrok Tso Lake and breathtaking views of Holy Mount Nyenchen Khangsar in the distance. 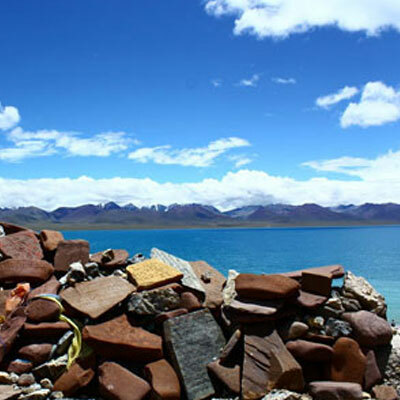 The turquoise, crystal clear Yamdrok Tso Lake is one of the three holy lakes in Tibet, the stunning vista of pincer- shaped turquoise water of the lake and amazing spectacle of Mount Nyenchen Khangsar glacier from Carola pass is highlights of the day. We continue our adventure overland journey along the Friendship highway to Gyamtse where we will visit the famous Stupa- Gyantse Kumbum, one of the most amazing architectural wonders in Tibet. After lunch in Gyantse, latter in the afternoon we take a short and scenic 2 hours drive to Shigantse. Overnight at hotel in Shigantse. Day 05: Drive from Shigantse to Shegar via Sakya. After breakfast, we will visit Tashilunpo monastery and the stunning tombs of Panchen Lamas, monks in the monastery are good looking in their hand-made traditional shoes- Tsomba in Tibetan. By noon, we will drive to visit Sakya monastery, the main monastery of Sakya sect, houses around the monastery are also in a typical gray color. Walk around the monastery northern ruins and drive back to Shegar. Overnight at guest house. Day 06: Drive from Shegar to Rongbuk monastery and then to Everest base camp. 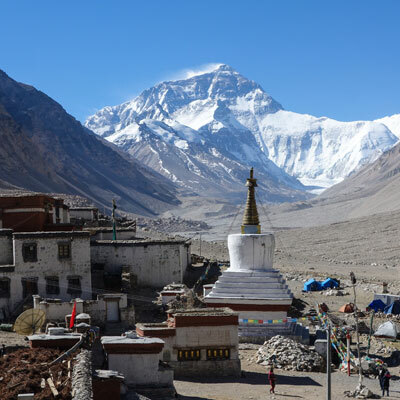 After breakfast at Shegar, we start driving to Everest base camp via Rongbuk monastery, cross the Gyatsola pass (5200m) and Gawa La pass (5250m), from the top of the Gawu la pass we can enjoy the breathtaking himalayan ranges and its glorious leaks such as Mt. Makalu (8463m), Mt. Lhotse (8515m), Mt. Everest (8848m), Mt. Cho Oyu (8200m)and Mt. Shishapagma (8020m) from left to right, climbing down through numbers of switchback bends lead to the dry valley of Tashi Zom and then to Rongbuk monastery which is the highest monastery in Tibet and it consists both monks and nuns, it is also a great view point to see Mt. Everest. Latter in the afternoon we trek to Everest base camp; it is only 8 kms and takes about 2 hours. As an option, we can join a local bus ride to Everest base camp instead of walking. Overnight at local tent guest house. Day 07: Everest base camp excursion and drive to Shigantse. After enjoying the grand sunrise at EBC, we will have breakfast at guest house and start driving back to Shigantse. The drive will takes about 7 hours to reach Shigantse. Overnight at hotel. Day 08: Drive from Shigantse to Lhasa via northern road. After breakfast, we start our drive following the northern highway to Lhasa. This is a scenic 7 hours drive from Shigantse to Lhasa. Overnight at hotel. After an early breakfast, our Tibetan guide from alpine eco trek will transfer you to airport or train station for your onward journey. As an option, we can drive from Rongbuk monastery to Nyalam and continue down to Zhangmu and then to Kathmandu instead of driving to Shigantse.